Hi, I’m Rebecca Walsh. 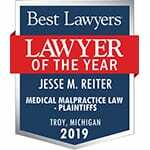 I’m a partner at Reiter & Walsh. I’ve been handling birth injury and medical malpractice cases for 25 years. I’m going to talk about something called periventricular leukomalacia, or what you might have heard as PVL or cystic PVL. There are certain parts of the brain that are very vulnerable for babies during the second trimester up until about 32 weeks of gestation. And that part of the brain is the periventricular region. If you have a baby that was born prematurely–after 25 weeks but before 32 weeks–and something happens in the ICU that is not good for the baby, it can cause a brain injury. The type of brain injury it will cause is typically either PVL, or more likely cystic PVL.